On 28 April 1998 the Shire of Dalwallinu in Western Australia adopted Acacia anthochaera (‘Kimberly’s Wattle’) as its official floral emblem. This occurred primarily through the urgings of Mrs Joy Wornes, an active member of the town’s tourism committee. 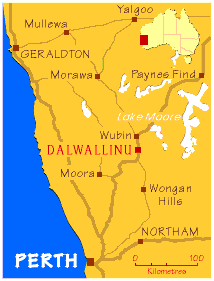 Dalwallinu is located 250 km northeast of Perth on the Great Northern Highway and is at the centre of the most species-rich area on earth for Acacia. Indeed, within a 100 km radius of the town there are about 185 species of Acacia, this being about the same number that occurs in North and South America combined, an more than occurs on the entire continent of Africa. 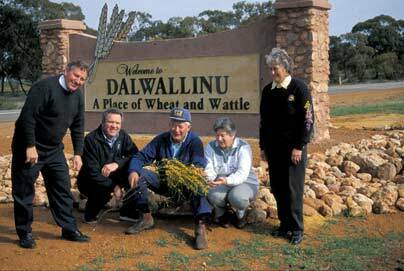 For many years Dalwallinu has been actively promoting Acacias, primarily to encourage nature-based tourism in the region. A Wattle Week Festival is celebrated in the town annually. In 2001 the Dalwallinu hosted a major Symposium that explored the conservation and utilisation potential of the Australian dryland species of Acacia. The Dalwallinu Shire is co-sponsor of this WorldWideWattle website. 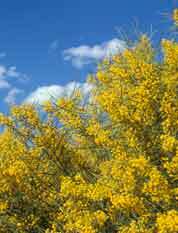 It is therefore very appropriate that a species of Acacia be selected as the floral emblem of the region. Dalwallinu now has two emblems, wheat (which is the Shire emblem) and Wattle (the Shire’s floral emblem) and the recently constructed town entry statements on the Great Northern Highway at both the northern and southern approaches to the town, reflect this dual badging. The botanical name is derived from the Greek anthos, meaning flower, and chairo meaning to rejoice. It alludes to the bright golden heads which occur in great profusion on the plants; flowering occurs between August and September, with the peak flush in September. The name also commemorates the birth of the species author’s daughter, Kimberly Sarah Maslin, which occurred in March 1991, around the time that the original draft of the A. anthochaera description was prepared. 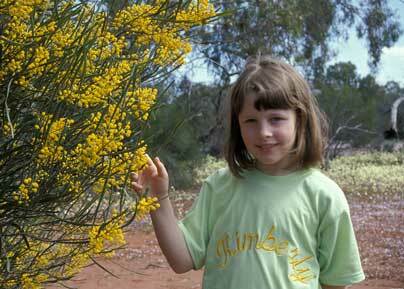 It is for this reason that the species is known by the common name, Kimberly’s Wattle. Acacia anthochaera is most commonly seen as a bushy multistemmed shrub 2-5 m tall, however, it does mature to a tree 7-8 m tall. 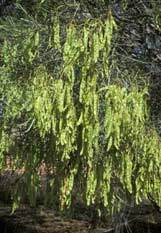 It is characterized by having long, linear, 1-nerved phyllodes, bright golden yellow, fragrant, flower heads that occur in great profusion in short racemes which are enclosed by bracts when young, and quite large, papery, yellow-brown, flat pods. 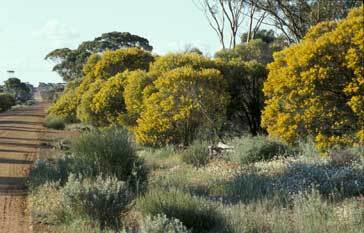 Kimberly’s Wattle occurs in the semiarid northern wheatbelt region of Western Australia from near Cowcowing to Yuna, but it does extend into the adjacent, more arid rangeland regions. Acacia anthochaera has a moderately fast growth rate and occurs on a wide range of soil types and as such has potential for use in a range of environmental purposes (e.g. salinity and erosion control, visual screens, windbreaks and shelter belts). It may also have horticultural potential and is one of lesser-known species considered to have possibilities for seed production for human consumption. Access to descriptions, illustrations and maps of Acacia anthochaera are provided elsewhere on WorldWideWattle. Complementary information is also provided in Maslin et al . (1998), Edible Wattle Seeds of Southern Australia (which explores the potential of Acacias as a human food). Information on the Wattles of the Dalwallinu Shire is provided elsewhere on WorldWideWattle.